20th Anniversary (3rd) edition of Albedo, by Sanguine Productions. The rules system is "completely re-engineered." 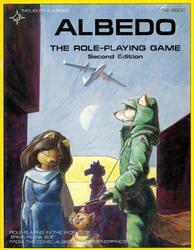 Albedo: Platinum Catalyst brings the drama of Steve Gallacci's long-running comic series to the stage of role-playing. Players take on both the roles of the commanding officers and their subordinates -- the teams of bold infantry, quick pilots, quixotic explorers, and clever scientists -- who must come to terms with their changing society as war threatens to tear it apart." 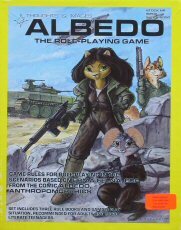 "The Albedo Role-playing Game is based on "Erma Felna, EOF", the feature story in the comic book Albedo, Anthropomorphics. 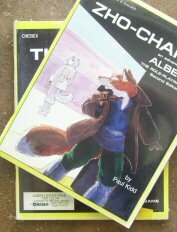 It is a dramatic, "hard science" science fiction tale with the unusual twist of characters that are funny animals. 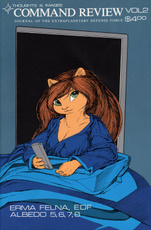 The anthropomorphic character races are portrayed as races in their own right, rather than simply being people dressed in furry animal suits. Albedo aims to be very different from run-of-the-mill science fiction adventure games. Although it can be played as a standard shoot 'em up, it contains easily usable rules for simulating character personalities, love, hate, loyalty, and treachery. Clever adventure plots, political intrigue, and interpersonal relations become readily playable, encouraging a very different type of game. Albedo's background material is notable for its well thought out technological base and the unique society it describes. The game includes details on languages and alphabet, social attitudes, and day-to-day life, as well as outlining dozens of different critter races. The abundant illustrations by Steve Gallacci, writer of the Albedo, Anthropomorphics comics, give the readeraclearview of the universe of "Erma Felna, EDF." You can play a member of the elite Extraplanetary Defense Force, fighting insurgent agents of the Independent Lapine Republic as they sow the seeds of revolt. Be a member of a local Homeguard, defending your planet from terrorist attacks. Or play a civilian caught up in the strife of a galaxy at war. All of this is possible in Albedo! Dice needed to play: 2d6." "When Zho-Chaka's once benevolent government became oppressive, the people voted in the youthful and energetic Zho-Chakan Progressive Party. Now the ZPP is the oppressor, but the change this time will not be as peaceful. "Many years ago, a bitter battle was fought. Now the debris from that battle, broken ships and bits of wreckage, floats in space, abandoned and alone. The player characters are wrecked near The Drift. They must improvise repairs to their wrecked ship from other ruined ships as their air and food grow dangerously low. Hungry, with interpersonal problems complicating their efforts, and air leaking out of their ship, will they succeed in time to survive? Is The Drift even more dangerous than it seems?" Sourcebook includes ship construction rules, deck plans, a sample campaign subsector, travel as seen by passengers and crew, and much more! 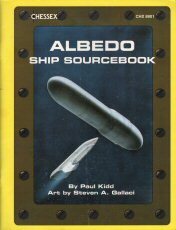 Ship Construction Rules for Albedo, Second Edition, are adaptable for many far-future space ships and games. These are the ships as.seen in the Albedo and Birthright series © by Thoughts and Images and used by their permission. 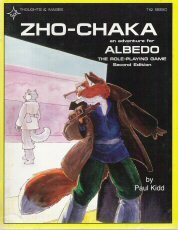 Below: Report for Duty"
"Includes CHX: 8800, 8850, 8851"
Special promotional set includes Albedo 2nd edition rulebook, Zho-Chaka, and The Drift. 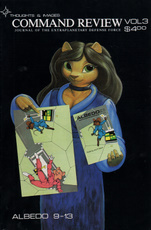 The ALBEDO Role Playing Game is based on ERMA FELNA, EOF, the feature story in the comic book "ALBEDO Anthropomorphics." Erma's story is a dramatic "hard" science fiction tale, with the unusual twist of having characters that are "funny animals." The funny animal format gives the story a strikingly different visual effect, and is a major factor in the scenario's unusual background material. The anthropomorphic character races are effectively portrayed as races in their own right rather than simply being people dressed in furry animal suits. 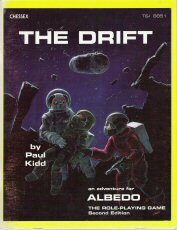 The ALBEDO Role Playing Game aims to be very different from the run-of-the-mill science fiction adventure game. Since the ERMA FELNA story relies upon character interaction and socio-political plot and intrigue to provide its plotline, the game allows this type of action to be role-played. Although the game can be played as a "shoot-'em-up" the role playing game contains some easily useable rules for simulating character personalities, love, hate, loyalty and treachery. Thus clever adventure plots, political intrigue and interpersonal relations become readily playable, encouraging a very different type of playing style. The game's background material is notable for its well thought out technological base, and the unique society which it describes. The game includes details on languages and alphabet, social attitudes and day-to-day life, as well as outlining dozens of different races. One of the game's strongest points is the quality of its artwork, which is all done by the artist and writer of the ERMA FELNA, EOF story, Steve Gallacci. The abundant illustrations give the reader a clear view of the universe of ERMA FELNA, and includes technical artwork. The game's core system uses a single chart to determine the results of all uses of skills and characteristics. A task difficulty system allows the success or failure of a character's efforts to vary according to the situation. The game system is therefore easy to learn, but has a wide range of potential applications. The character generation system creates distinct differences between the various races. Character personality and psyche is created as a part of the basic character generation procedure, providing a quick and easy role playing guideline for each character. The combat rules use a hit location system, but instead of simple points subtraction, describes wounds which effect character abilities. The combat turn is subdivided into phases. Characters have varying numbers of actions per turn depending on their individual abilities. There is therefore an even balance between the large, rugged character races and their fast, light counterparts. This basic game set includes three rule books, background and character generation, equipment and technical background, and referee's manual, which makes the compleat basic game. The set also includes a sample setting and situation booklet for some introductory play. Future optional items such as additional play settings, expanded background and technical references, and playing figures and vehicles will become available to enhance play as desired."